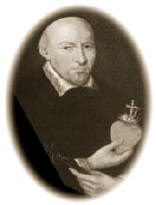 (1601-1680) Born in France, he was a gifted preacher and encouraged devotions to the Hearts of Jesus and Mary. Specially concerned to council and defend endangered women, he founded an association of priest and the religious Congregation of the Sisters of Our Lady of Charity. we may live faithfully by the light of the Gospel.